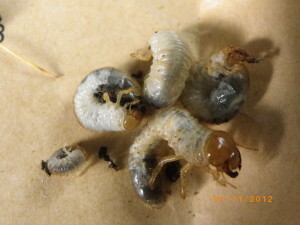 Our Members’ are reporting a large increase in lawn pests in their customer’s lawns; typically chafer grubs and leather-jackets and if you have them in your lawn then that’s really bad luck and we are presented with a problem. Since EU pesticide legislation withdrew the tested and proven insecticide treatments we are left with only organic solutions and nematodes is the only answer at the moment. Other insecticides are being tested meanwhile but if you do think your lawn is blighted with pests then please call your local lawn care service company for on the spot advice.